Lock in a great price for Coral Tulum – rated 8.9 by recent guests! Everything is absolutely perfect there But there is a lot of algae in the water rght now which is annoyingly. The room was very nice and spacious. Nice shower area and bathroom. Quiet. Woman concierge is excellent! This was the second time I've stayed there and brought 2 other couples this time Everyone loved the resort. The staff was amazing. Very attentive, 5 star service. The food was delicious and the staff was extremely accommodating and friendly. It’s an amazing place. I love everything about it. I went last year for the first time and came back again this year. Would recommend this to anyone. Amazing staff who go above and beyond, so attentive and accommodating. Breakfast was lovely with lots of options. Room was amazing with loads of space, always kept very clean and looked brand new every day. Beautiful setting and close to loads of amazing yoga, spa and food options. Breakfast was excellent (included) and not many better views when you have it on the beach. The rooms are big and spacious and always immaculately cleaned every day. The staff are very helpful and attentive and the food (lunch & dinner menu) is top quality. Highly recommend the spicy lobster empanadas.. The private pool on the deck was the best. We used it many times every day and it felt so special. The rooms were absolutely gorgeous. A great location near some of the best restaurants in Tulum. Easy walking distance. 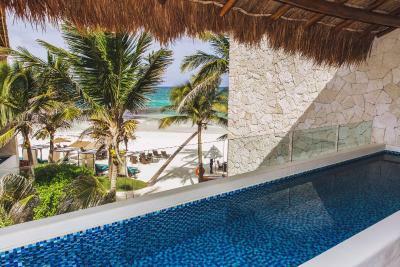 Coral Tulum This rating is a reflection of how the property compares to the industry standard when it comes to price, facilities and services available. It's based on a self-evaluation by the property. Use this rating to help choose your stay! Offering a restaurant, Cilantro´s, this beachfront hotel is located in Tulum's hotel zone and offers free WiFi access to guests. Rooms at Coral Tulum include a mini-bar and TV with satellite channels. Coffee-making facilities are provided and a private bathroom features a double shower, hairdryer, and free toiletries. Rooms boast garden or sea views with a private pool. A garden and 24-hour front desk service are available for guests' use. Other facilities offered at the property include a tour desk and luggage storage. Free parking is available. Our hotel boutique is 3.7 mi from Tulum Archaeological Site, 2.4 mi from Parque Nacional Tulum, and 5.5 mi from Cesiak. When would you like to stay at Coral Tulum? It's comfort that really means luxury to me. House Rules Coral Tulum takes special requests – add in the next step! Coral Tulum accepts these cards and reserves the right to temporarily hold an amount prior to arrival. The Pool was cold this time. Hope they fix it soon. Bike rentals were overpriced compared to other hotels. Staff/workers were noisy around the room during the early morning hours (6-9) so don’t expect to sleep in. Rooms were huge. Strong WiFi in the room. Hotel restaurant too poor. This is certainly not considered a 5 star. For me is a 3 star. If I was priced half the price I would say is fair. Staff don't speak good English and everything you ask you have to explain 10 times . Basically too poor. Even the location is poor for the price I paid I could have stayed in 4 seasons in any European city. The room was nice and big and comfortable bed. Shower was nice . The hanging chair facing the room. Soupy yogurt and guacamole. Slight torn bills not taken. Lukewarm water in shower. Seaweed on the beach at our feet. water suggested and bottles brought with a fee.slow redtaurant service and bringing g menus to table and paying. No maps given at check in or advice on taxi tipping. However I would not recommend this hotel for families with one year olds. Not much really, was perfect for us. Staff friendly but not professionally trained to correct standard. Igiene and safety of kitchen was totally lacking, reflecting in both of us having food poisoning, HAVING HAD ONLY FOOD FROM Coral Tulum. The worst part was however making our 3 months baby very sick; Having reassured us they were boiling the water for the baby’s milk we only found out on day 3 they weren’t, when our baby fell ill. Not withstanding the gravity of the situation they weren’t helpful to the point that they made us purchase our own kettle because they didn’t hav one (shameful for a boutique hotel). The on-site restaurant has good fresh food and beachside service - but the restaurant itself is dark and has no view. Breakfast isn't served until 8. However, you can eat a complimentary breakfast ten minutes down the beach at the sister restaurant, Ana y Jose, which has a great view. Other meals we ate out at the excellent nearby restaurants and there was coffee, fruit and a stocked mini-bar in the room, so it didn't affect us much. The area is expensive in Mexican terms. But you do get what you pay for and much more intimate than the larger hotels up the coast. Perfect location and room. Attentive staff. Gorgeous beach area. Exceptionally clean and well kept hotel. I will be back.